Justin A. Cohn | The Journal Gazette Komets forward Taylor Crunk, right, collides with Brandon Fehd of the Rapid City Rush as they battle for the puck behind the net at Memorial Coliseum on Saturday night as Rush goalie Tyler Parks, left, waits for a shot to come his way. Justin A. Cohn | The Journal Gazette Rapid City Rush goaltender Tyler Parks, right, is tripped up by Komets forward Marco Roy, after he's sent into the Memorial Coliseum net by Rush captain Riley Weselowski on Saturday night. 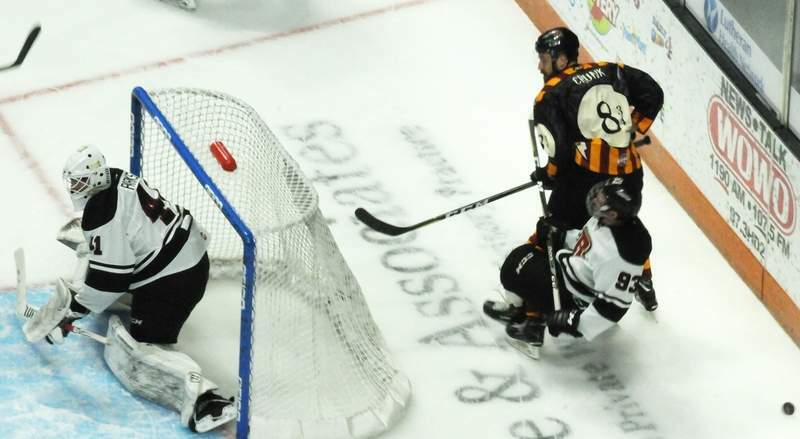 Despite the 2-1 loss to the Rapid City Rush, the Komets felt there was improvement Saturday night. They outshot the Rush 51-28, but couldn’t solve goaltender Tyler Parks. Coach Gary Graham said the big thing was going 0 for 5 on the power play. “We’re getting Grade-A looks. We’re looking at them on video. We have to find a way of bearing down and winning those little stick battles in front of the net. There were a lot of little stick battles that if we’d win those things, we’re putting in second chances; there were rebounds laying around that we could have sniffed on a little bit better,” Graham said. Remember, all of those new acquisitions, they weren’t playing. The Komets remained without their all-star forward, Justin Hodgman (hand), who missed an eighth straight game, and Jordan Sims (hip), and they scratched Oskari Halme and Garrett Clarke, Guillaume Naud and Quintin Lisoway. Though everyone I spoke to downplayed this, I feel like there has to be some more pressure for guys to battle to be in the lineup. “We’re not trying to get guys squeezing their sticks harder,” Graham retorted. Schaafsma said there had been a lot of meetings among the players on righting things and they feel the urgency; they know they’re in fourth place in the division and have to get things turned around. By the way, I had more than one person remark to me that the Komets are disappointed that they've had some letdowns in front of large crowds this season, including Saturday and New Year's Eve. They know that's not the Komets' way. This was better, though, in that they played physically, had a fight, a lot of shots. It was nothing like Dec. 31.